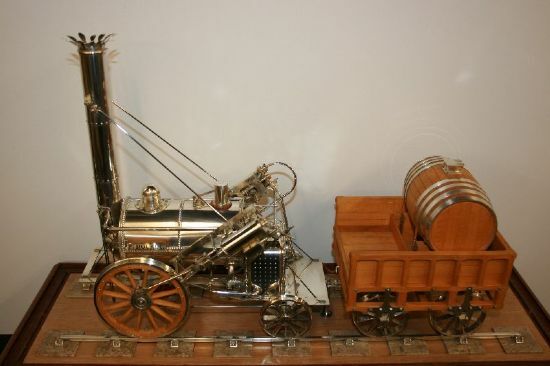 Solid silver model of the 'Rocket', built by Dr J Bradbury Winter and in the collection of The Institution of Mechanical Engineers. Club member Eric Dewhirst was speaker at the 25th March meeting and chose as his topic the hobby of ‘engineering in miniature’. This was illustrated with his partly built steam wagon - a 1/6 size version of a 1920’s prototype built by Clayton Wagons Ltd of Titanic works, Lincoln. Clayton built their first road vehicle in 1894 and continued for 70 years. At their peak they employed 5000 people on a 100-acre site. Eric went on to describe the hobby of constructing proportionally-scaled working representations of full-sized machines in miniature. It is skilled metalworking with a strong emphasis on artisanry or craftsmanship. We also heard something of the history of the hobby - with origins in the Industrial Revolution where new technical skills were needed to make machinery, service it and organise factories. The hobby reflected social change. Hugely influential were the Mechanics Institutes; educational establishments, originally formed to provide adult education in technical subjects, to working men. Often funded by industrial philanthopists such as Robert Stephenson, James Nasmyth and Joseph Whitworth. The world's first Mechanics' Institute was established in Edinburgh in October 1821 as the School of Arts of Edinburgh - still there almost 200 Years later as Heriot Watt University. Eric spoke too of some of the men who contributed over the years to popularise the hobby and provide designs and ‘how to make it’ instructions in books and magazines - especially the ‘Model Engineer’ magazine, founded in 1898 and still going strong. An unexpected name was Neville Shute Norway - best remembered as an author of novels such as Pied Piper, A Town Like Alice and On The Beach. But he was himself a professional Aeronautical engineer and a maker of models too. His last book ‘Trustee from the Toolroom’ had as its hero a model engineer. In conclusion we were brought up to date with the work of Cherry Hill, nine-time winner of the Duke of Edinburgh’s Challenge Trophy for excellence in model making. She is outstanding in the quality of her work. Following questions a vote of thanks was proposed by Steve Blaney.